A professor and other researchers at the University of Montreal have tested out Assassin’s Creed Origins’ “Discovery Tour,” an educational mode that enables players to explore the historical game world in a museum-like context. The Discovery Tour, which features 75 audio-guided interactive tours designed by historians and Egyptologists, launched with the video game Assassin’s Creed Origins last October for home consoles and PC. Professor Marc-André Éthier tried the mode with nearly 300 high school students across eight schools and 40 classes. The study compared the learning outcomes of a group following the game’s tours with those of a group learning about the subject from a teacher, who used still images from the same tours. Éthier found that students who used only the video game improved their grades from 22 percent to 41 percent while those who had the teacher’s guidance improved their grades to 55 percent. What does this mean? Éthier believes that a hybrid approach of video games and traditional instruction could further enhance learning. 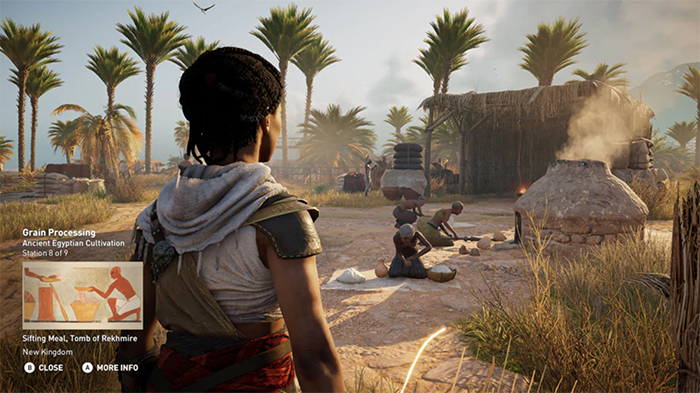 The university’s research was conducted independently of Ubisoft, the Montreal-based company that created Assassin’s Creed Origins and its Discovery Tour feature. Ubisoft is releasing the Discovery Tour free of charge on February 20 to anyone with the Origins game, or $20 to the general public as a standalone mode on PC. Ubisoft isn’t ruling out creating educational modes like the Discovery Tour around other settings in the Assassin’s Creed series, but that’s still a far-off possibility. “We cannot wait to examine this possibility, to hear what people have to say about this initiative,” said Yannis Mallat, the president and CEO of Ubisoft Montreal.